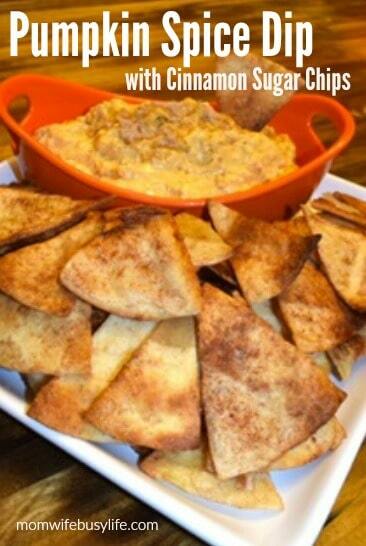 Pumpkin Spice Dip with Cinnamon Sugar Chips - Mom. Wife. Busy Life. Pumpkin is flying off the shelf this time of year. Everything from pumpkin bread and cakes to pumpkin waffles is being made right now. One of my favorite pumpkin filled treats is this cool and creamy pumpkin spice dip! It has a smooth and creamy texture that goes great with graham crackers, ginger snaps or homemade cinnamon and sugar tortilla chips. My girls have been begging me to make more of this fall yumminess! 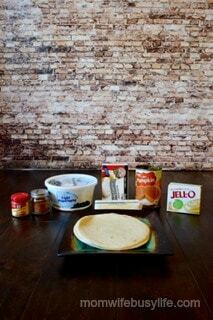 Whip cream cheese, cool whip, and pudding mix with hand mixer. Stir in pumpkin, cinnamon, and pumpkin spice. Chill in refrigerator until serving time. 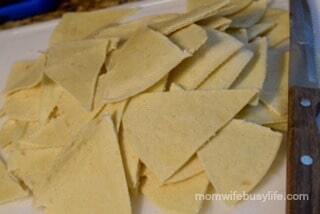 Using a pizza cutter (or knife), cut flour tortillas into triangle. Spread triangles on a cookie sheet lined with parchment paper. Drizzle melted butter and cinnamon sugar mix over triangles and lightly toss. Spread evenly on pan and bake for 10 mins. or until golden brown.